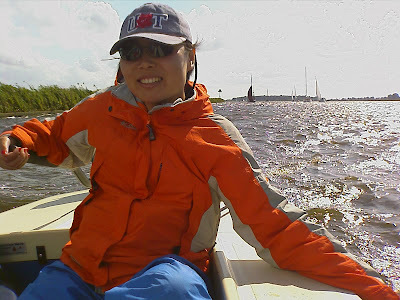 Dos Chinos on Dos Wheels: Sailing was great! Shu and I paid a quick visit to The Netherlands -the first time since I left in May- to attend a wedding (congratulations N&F!) and go sailing with some friends. It was a very hectic few days (would you expect anything else from us? ), but definitely a lot of fun. I'm already back in UAE, back to work, Shu's in Amsterdam staying with a friend and leaving for Prague tomorrow. We were very lucky with the weather. Predictions told us to basically expect anything, from rain, showers, occasional lightning, the works... But thanks to the ever-reliable Ferdinandt Goed Weer Garantie (Ferdinandt Good Weather Guarantee), we stayed dry the whole time and even enjoyed a very welcome 4-5 beaufort wind, which made for excellent sailing! Agreed, great weekend, lots of fun and excellent food. Well Fred, now that the FGWG is out in public you might become busy building a little business out of your weather guarantee! Hail Ferdi. We Canadians need to borrow him.